Of the two National Parks in Armenia, Lake Sevan in Sevan National Park seemed the more popular. However, I found myself in the other - Dilijan National Park, and really enjoyed myself there. 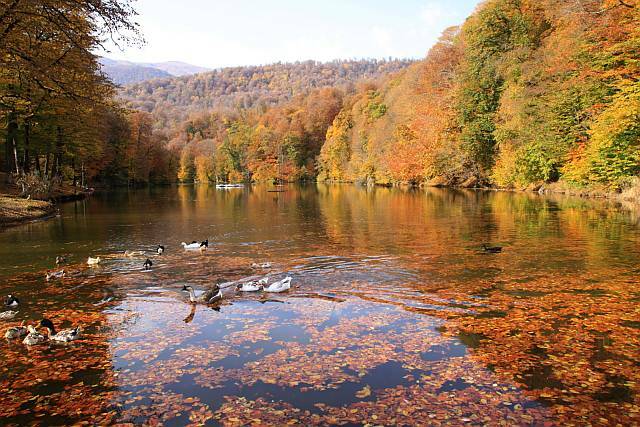 Covered by a large expanse of forest, Dilijan National Park is a fairly new National Park, being only established in 2002 (formerly known only as a 'Reserve'). But all along, it had been known for its flora and fauna, as well as hosting some cultural monuments (mainly monasteries and churches). It is also no wonder that hiking through the park a common activity. Within the park is also a small lake, Parz Lich (Lake Parz), from where a popular hiking trail starts. It is an image of this lake in autumn that got me to this place. 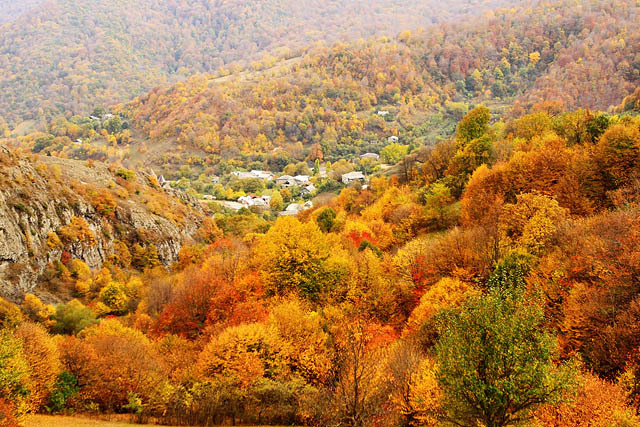 And indeed, the autumn foliage in Dilijan is amazing! Certainly one of my higher-ranked autumn foliage sceneries! And I was lucky that I met a group of hikers from a local outdoor/hiking group in Yerevan out on an outing. So I managed to join them for a wonderful hike ending at one of the cultural monuments in the park, Goshavank Monastery. The hike, was of course, an amazing way to enjoy the sceneries of the park, and passing through some villages, we were also treated to their hospitality. 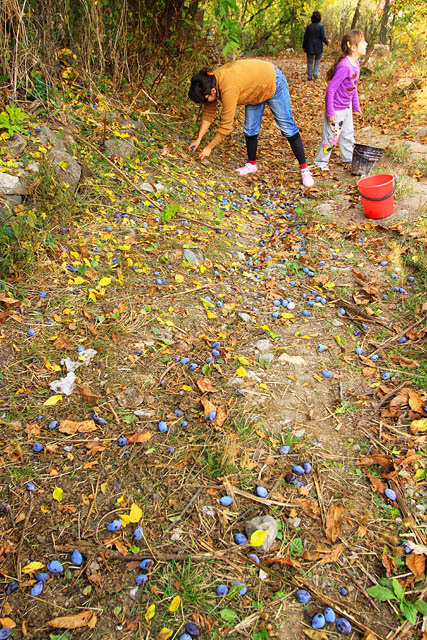 It happened to be fruiting season, and the villagers were collecting loads of plums and we were welcomed to help ourselves. Truly refreshing! 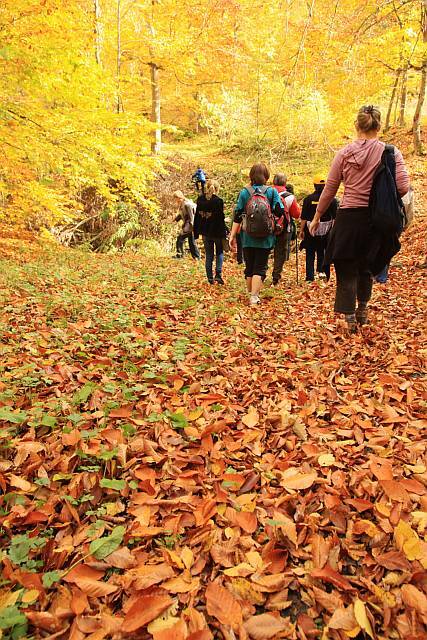 Apparently, the forests of Dilijan not only contain many fruits trees, but medicinal plants as well! 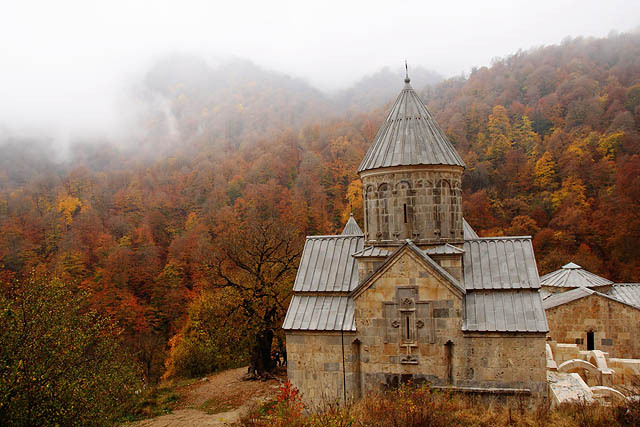 Goshavank Monastery is a 12-13th century Armenian monastery complex consisting of several churches, chapels as well as a bell tower. The buildings looked well preserved, as it is now a popular tourist attraction. When we ended our hike there, there were quite a few local tourists there as well. Within the autumn backdrop, it was really pretty. However, there was no public transportation there now from what I'm aware of. I had arranged a car/taxi ride to Parz Lich, and had hoped to hitched a ride back to Dilijan town at Goshavank. But as I said, luck was on my side since I managed to join the hiking group for the hike, and got my ride back with them! (They had a specially chartered van from Yerevan). However, it's easy enough to arrange a car/taxi dropoff at Parz Lich and pickup at Goshavank. 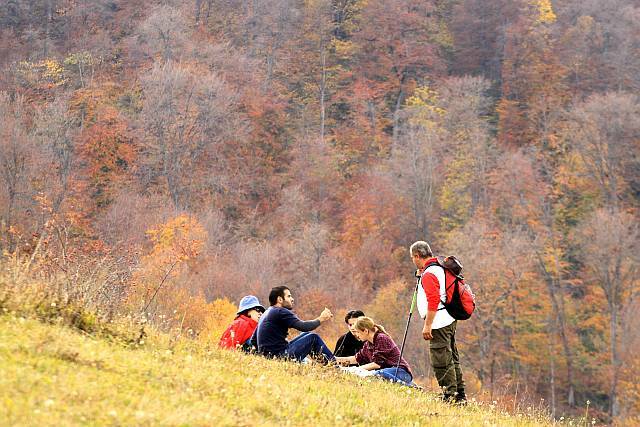 Remember next time, for autumn foliage, consider Dilijan National Park!